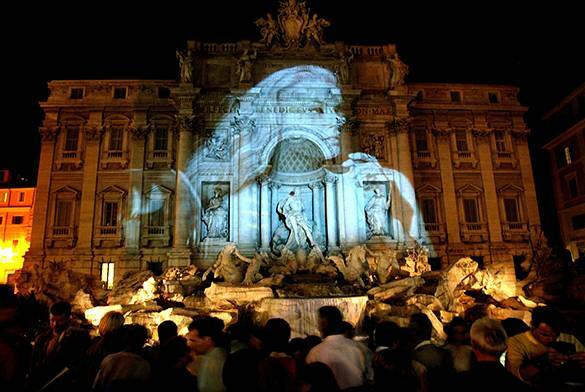 The Trevi Fountain and the Dolce Vita! Designed by Italian architect Nicola Salvi and completed by Pietro Bracci. Standing 26.3 metres (86 ft) high and 49.15 metres (161.3 ft) wide. Legend holds that in 19 BC thirsty Roman soldiers were guided by a young girl to a source of pure water thirteen kilometers from the city of Rome. The discovery of the source led Augustus to commission the construction of a twenty-two kilometer aqueduct leading into the city, which was named Aqua Virgo, or Virgin Waters, in honor of the legendary young girl. The aqueduct served the hot Baths of Agrippa, and Rome, for over four hundred years. The fountain was refurbished in 1998. The stonework was scrubbed and all cracks and other areas of deterioration were repaired by skilled artisans and the fountain was equipped with recirculating pumps. 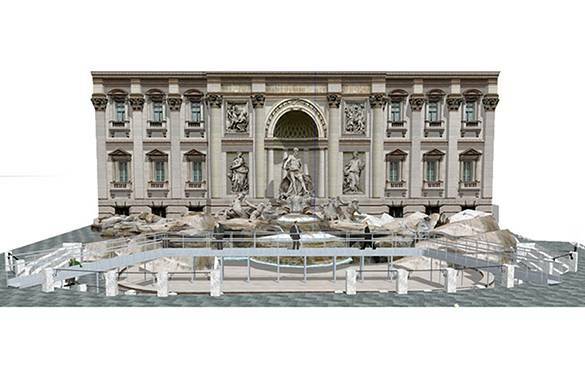 In January 2013, the Italian fashion company Fendi sponsor a 20-month, 2.2 million euro restoration of the fountain. This was the most thorough restoration in the fountain’s history. Throw a coin in the Fountain! Coins are purportedly meant to be thrown using the right hand over the left shoulder. This was the theme of 1954’s Three Coins in the Fountain and the Academy Award-winning song by that name which introduced the picture. An estimated 3,000 Euros are thrown into the fountain each day. Which means about 90,000 euros per month and… almost 2 milion euros per year! The money has been used to subsidize a supermarket for Rome’s needy, however, there are regular attempts to steal coins from the fountain. The fountain has appeared in several notable films, including Federico Fellini’s La Dolce Vita. 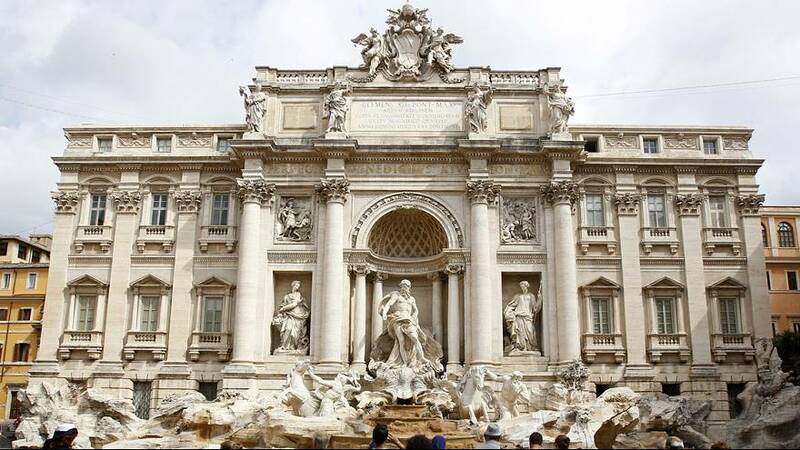 The Trevi Fountain is featured in Respighi’s symphonic pictures Fontane di Roma, and was the setting for an iconic scene in Federico Fellini’s film La Dolce Vita starring Anita Ekberg and Marcello Mastroianni. 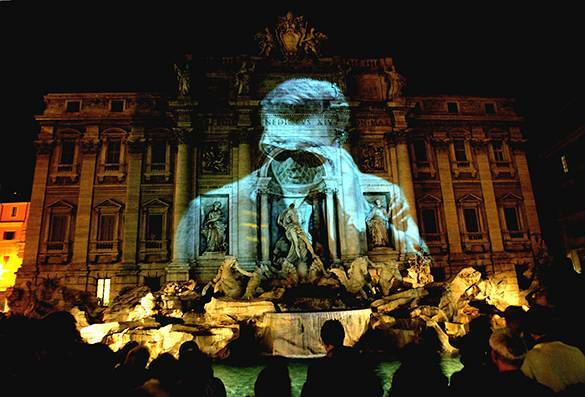 The fountain was turned off and draped in black in honor of Mastroianni after the actor’s death in 1996. Shirley MacLaine and Christopher Plummer recreate the La Dolce Vita scene in the 2014 film Elsa & Fred. The fountain is used for some scenes in the 1953 film Roman Holiday, starring Audrey Hepburn and Gregory Peck. Also in the 2003 The Lizzie McGuire Movie. 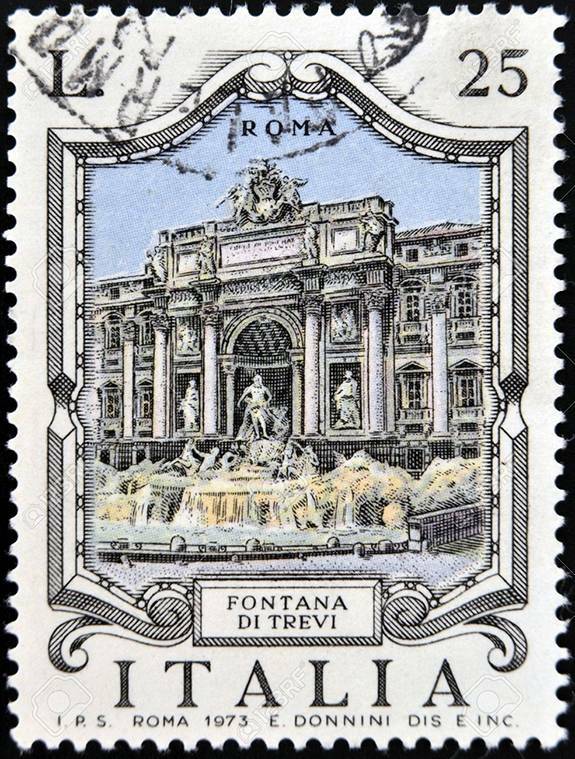 In 1973, Italian National Postal Service dedicated to Trevi Fountain a postage stamp.